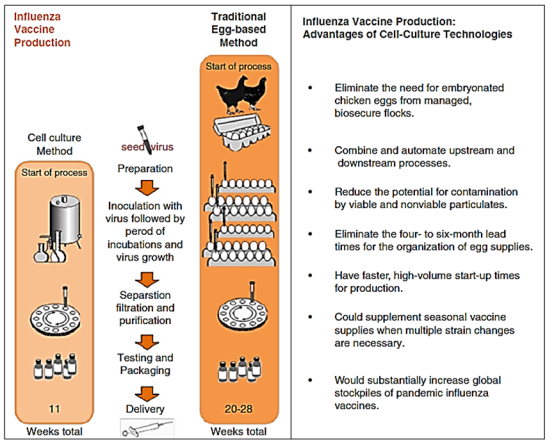 Importance of the field: Cell culture-based method for influenza vaccines production offers various advantages over egg-based manufacturing method during influenza pandemics. Areas covered in this review: Benefits of cell culture-based method for influenza vaccines production have been discussed, including: Increasing vaccines production capability during pandemics, preventing the development of mutations and providing better manufacturing control. Besides that, recent challenges of using cell culture as an alternative to egg-based method have been also covered, such as low yield of some influenza virus strains in cell culture and ability of the selected virus strain to grow on specific cell culture line. What the reader will gain: The reader will gain an overview of the advantages of using cell culture-based method as an alternative way to the existing egg-based manufacturing method for production of influenza vaccines. Also, the reader will come to know the recent challenges facing the new cell culture based technology. Take home message: Influenza vaccines produced by cell culture method promote safe and innovative vaccine regimens that could significantly broaden and extend protection against influenza. Influenza “Flu” is a one of the most important viral diseases that remains a threat to humans worldwide due to its great health and economic impacts. The disease is highly contagious and affecting respiratory disease [1-3]. The key feature of influenza virus is due to its ability to cause sporadic pandemics in human population with subsequent persistence which threats the public health continuously . The genome of influenza virus consists of eight, single-stranded RNAs . Influenza viruses are grouped into three types: A, B and C based on the virus antigens (nucleoprotein and matrix protein). Type A is the most important one because it affect human as well as animal too. While types B and C are affecting human only. Influenza viruses type A are typed according to the expression of two surface proteins attached to the envelop of the virus: the hemagglutinin (HA) and neuraminidase (NA). For example, influenza A subtype H3N2 is refer to an expression of hemagglutinin 3 and neuraminidase 2. Influenza virus continuously changes its antigenicity. Therefore, in each season new influenza virus strain comes out and results in an accumulation of many virus strains. However, H1N1 and H3N2 influenza virus strains are the most prevalent human influenza viruses . Two key features, antigenic drift and antigenic shift, are the reasons behind the continuous changing of the antigenicity of influenza viruses, and this renews the host susceptibility to influenza viruses and result in frequent changes in the viral components of seasonal influenza vaccines [5, 6]. Antigenic drift is a replication error, which results in genetic mutations mainly in HA . While antigenic shift is the ability to shift the genetic material, because its genome is segmented, between two different influenza viruses in the same infected host cell (co-infection), and result in reassortment (shift) of their genetic materials. Improve human welfare by preventing influenza can be achieved widely by using vaccines . Vaccination against influenza is the main procedure in the prevention and control programs of the disease . Two main types of influenza vaccines have been developed for pandemic influenza on the bases of existing seasonal human influenza, the inactivated and the live attenuated virus vaccines [1, 4, 5]. Accordingly, to achieve the maximum effect of influenza vaccines, the vaccine viruses strains and the human isolated strains have to be antigenically matched . The standard method for production of influenza vaccines is using the fertilized chicken eggs to grow the virus. However, this method has many limitations including: difficulties to produce large numbers of influenza vaccines in relatively short time because it is limited by number of embryonated eggs available. In addition, long time needed for planning and production could complicate the manufacturing process. Furthermore, the use of egg-based method is associated with generation of high growth reassortants (HGR) and difficult manufacturing control like contamination that might be happen during vaccine producing steps [3, 9]. The limitations of currently available egg-based method demanded more effective, rapid, efficient, and reliable vaccine production technology in the event of a pandemic [1, 4]. Accordingly, researchers tried to evaluate cell culture vaccine production methods to replace egg-based production method [10-12], and different types of cell lines have been developed and used successfully to produce influenza vaccines, for example, the continuous mammalian cell lines from monkey kidney cells named Vero cells which is abbreviation of “Verda Reno”, Madin Darby canine kidney cells (MDCK)  and human-derived PER.C6 cells [14, 15]. Huge progresses have been made and many published articles present data that support the advantages of replacing egg-based production by cell culture method. However, up to day, this issue still controversial and many challenges still lie ahead . This review focused on benefits and challenges of using cell culture method as an alternative to the current egg-based method to produce influenza vaccines. Figure 1 Vaccine production by classical egg-based technology and novel cell-culture processes: Timeline comparison and advantages of cell culture-based manufacturing methods . The first use of mammalian cell cultures was in the early 20th century for cell physiology studies. However, the animal cell culture at an industrial level has not been used until the 50’s . Since last two decades, huge finances and resources have been invested to develop and improve cell cultures to replace chicken embryonated eggs for influenza vaccines production. Shifting vaccine production from eggs to cell culture can offer many benefits including, increase the ability to produce enough vaccines when pandemics occur, prevent the possibility of mutations that might happen in the virus surface glycoproteins especially the HA and provide optimum control of vaccine production and processing steps by using closed systems [18, 19]. Cell culture-based vaccine production method offers time saving rather egg-based production methods and substantially shorten manufacturing timelines. One of the most important limitations of egg-based vaccine production is time consuming process and limited egg resources could be available during the time of a pandemic (Figure 1). Therefore, continuous supply of eggs is needed to maintain the vaccine production [16, 20]. Another limitation is the ability of influenza viruses to grow on egg. Not all influenza virus strains can be grow during primary isolation and sometimes adaptation need be performed to increase the probability of the virus to grow in egg [3, 18, 21, 22]. On the other hand, Donis, et al. were successfully able to isolate influenza virus (H3N2) strains using MDCK cell lines, which have been difficult to isolate directly in eggs. Le Ru, et al. proved that cell culture can potentially scale-up the production process with high titers of virus particle. They used serum free suspension of HEK-293 human cell line for replication of different subtypes and variants of influenza virus, including A/H1, A/H3, to produce up to 109 IVP/mL (infectious virus particles) in three liters bioreactor. Aggarwal, et al. were successfully able to develop a platform process for manufacturing influenza vaccine and reduce the production time to approximately three weeks. Finally, cell culture method can be cryopreserved, reconstituted, and scaled-up at any time which means it can significantly save time and efforts. These results clearly demonstrated that influenza viruses isolated in certified cell culture may offer a good option to reduce the steps needed to produce influenza vaccine. Hence, it can significantly save the time required for production of the vaccine especially in the event of pandemic [26, 27]. Production of seasonal influenza vaccines are usually performed using viruses adapted to grow in eggs. These vaccines have been proved to be safe and efficient. However, the use of egg-based method is associated with regular increasing of mutations that affect the antigenicity of the circulating influenza viruses. This will lead to generation of high growth reassortants, and finally mismatching between the circulating strain and vaccine strain would happen which result in low efficacy of the vaccine [28-30]. Influenza vaccines derived from cell culture would allow influenza virus vaccine strain to be produced closer to the circulating strain, and finally reduce the probability of mismatches that could be happened between them . Additionally, the selection of antigenic variants, which is necessary for adaptation and growth of the virus in the eggs, could be omitted by using cell culture to isolate and grow the vaccine virus strains. Based on the previous facts, it is clear that the cell culture-derived vaccines would be potentially more effective than egg-derived vaccines. Hence it could offer more protection against the circulating virus strains . Production in cell culture offer greater manufacturing control factors over egg-based method [3, 16]. The infection parameters like changing media and adding supplements can be easily performed. Furthermore, monitoring and adjustment of oxygen contents and pH can be controlled according to the growth phase [11, 31]. On the other hand, the production process based on the infection of eggs is more complicated than the cell cultivation using fermentation processes as each egg represent a separate unit of vaccine production . Another control factor is related to the safety of the produced vaccines. The well characterized mammalian cell cultures can match the increasing safety demands by regulatory authorities. The growth of validated cells which are tested for purity, identity according to the relevant regulation and guidelines can add superior advantage of using cell culture instead of eggs for vaccine production [2, 33]. Although influenza vaccines production mainly relies on egg-based method, concerns about the risk of contamination due to chicken flora was significantly increased. The possibility of contamination of the supplied egg by avian pathogens or microbial contaminants that might occur during vaccine processing, can add more challenges for the egg-based method [4, 31]. Cell culture offer removes the possibility of contamination, and using closed manufacturing systems can greatly minimize the risk of contamination during manufacture process [3, 34]. As commented above, cell culture has many advantages over egg-based method for production of influenza virus. However, many technical problems are still unsolved which stand as an obstacles and prevents the replacement of egg-based method. Minor, et al. mentioned, “Although cell culture has been introduced successfully in manufacturing influenza vaccines, different issues regarding the type of cell line, reference virus derivation and even the regulatory process, have to be assessed, and whether or not they have an adverse impact on cell culture manufacturing processes”. In this review two limitations will be discussed, the low yield and the ability of the selected virus strain to grow on specific cell culture line. Low yield of some influenza virus strains in cell culture is considered as one of the limitations that still challenging this method. Factors affecting both of system control and cell culturing conditions need to be controlled and adjusted in the way that can provide suitable environment and offer maximum virus production. For example, the carrier/reactor process with microcarrier, adherent cells, is currently the preferred method to cultivate the cells needed for influenza viral replication due to its high surface to volume ratio and better control of the cultivation parameters. However, challenges facing the application of this technology at commercial level are still persist. Cell culture using microcarriers requires further steps including cells distribution on a surface for subsequent growth, maintenance of the suspension in the fermenter, and finally products separation from the microcarriers [34, 35]. Another limitation that facing cell culture is the ability of the selected virus strain to grow on specific cell culture line. It is obvious that some wild type reference strains could give low yield of antigen using the egg processing method which leads to produce HGR. At the same time, sufficient growing of a wild type virus in cell culture can reduce the HGR. However, there is a significant risk that a virus able to grow on one type of cell culture may not be able to grow on others. The MDCK cells are showed to be better than eggs for influenza virus isolation. However, variation between different MDCK cell lines used for vaccine production could be challenge as some of influenza strains are not able to grow properly and Vero or PER.C6 may be needed to achieve proper isolation and subsequent steps for vaccine production [36, 37]. This consider as a significant challenge which requires production of different candidate vaccine viruses every year suited with the culture substrate . The introduction of cell-culture technology for production of influenza vaccines offers many benefits over egg-based vaccine production method, with a high potential to better face future influenza-related challenges. More technical and scientific innovations efforts have to be done to achieve both ease of manipulation and host compatibility expectations. "Cell Culture for Producing Influenza Vaccines." UKEssays.com. 11 2018. All Answers Ltd. 04 2019 <https://www.ukessays.com/essays/biology/cell-culture-producing-influenza-5345.php?vref=1>. "Cell Culture for Producing Influenza Vaccines." All Answers Ltd. ukessays.com, November 2018. Web. 26 April 2019. <https://www.ukessays.com/essays/biology/cell-culture-producing-influenza-5345.php?vref=1>. UKEssays. November 2018. Cell Culture for Producing Influenza Vaccines. [online]. Available from: https://www.ukessays.com/essays/biology/cell-culture-producing-influenza-5345.php?vref=1 [Accessed 26 April 2019]. UKEssays. Cell Culture for Producing Influenza Vaccines [Internet]. November 2018. [Accessed 26 April 2019]; Available from: https://www.ukessays.com/essays/biology/cell-culture-producing-influenza-5345.php?vref=1.